Travel through the rich Waikato farmland to the Hamilton Gardens and on to the Pirongia Clydesdales. Tour the carriage house and harness museum, meet the Clydesdale horses and take a stagecoach or wagon ride around historic Pirongia, stopping for a picnic lunch on the way (lunch included). On to Otorohanga to visit the Kiwi House and native bird park. Visit the world-famous Waitomo Glowworm Caves which have attracted millions of people from all over the world for more than 100 years. 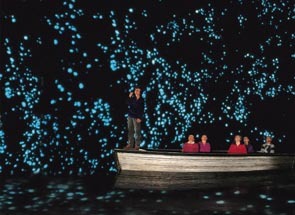 Take a boat ride through the eerie darkness of the Glowworm Grotto to see millions of glowworms lighting up the roof. Go your way with the essential online New Zealand travel guide.